Crystal Cove state park offers an affordable accommodation option to the often pricey lodging in the surrounding Newport Beach area, and is the perfect place to take your RV rental! The park was established in 1979, and covers almost 4,000 acres, including just over 3 miles of unspoiled Pacific coastline. California is the most populous state, although it’s easy to feel completely alone on the park’s trails and beaches. Several movies have been shot here over the years, including the 1988 ‘Beaches’ starring Bette Midler. One of the appeals of Crystal Cove is the variety of activities that are available. Hikers and walkers can enjoy 18 miles of trails of varying difficulty, although all of them offer stunning views of the coast, woods or mountains. The trails are also popular with mountain bikers and if you prefer a more leisurely pace, they can also be used for horseback riding. Many families visit Crystal Cove for the several beaches, all of which have easy access. The waters off the coast have been designated an underwater park, which covers 1,100 acres as well as a marine conservation area. The stretch of coast makes the ideal spot to simply relax, or take part in a range of water sports, including body boarding, kayaking, surf fishing and paddle boarding. Pelican Point beach is considered one of the best places in the area to observe local wildlife, including over 180 bird species, while children and adults alike enjoy exploring the tidepools, with their fascinating sea creatures. The park’s historic district was built during the 1930s as a fashionable seaside retreat, and is today considered one of the state’s last remaining such examples. many of the 46 small but comfortable cottages can be rented out, and rates have been kept as low as possible, to make the unique accommodation affordable to as many as possible. And if you consider yourself the artistic type, Crystal Cove has for many years attracted painters who specialize in outdoor landscapes. Crystal Cove offers primitive camping, as well as less basic camping options in Moro campground. Here there are 30 tent campsites, with a shower block and restrooms. There are 32 primitive camping sites which are only accessible by hiking several miles along one of the trails, and you will need to take everything you might need with you. There are basic toilet pits and picnic table here, and campers will need a permit from the park ranger office. If you are touring southern California by RV, and are looking for an affordable and picturesque place to park for the night, Crystal Cove state park is an ideal choice. The park offers 28 RV and trailer campsites, and is ideally situated on a hillside offering views over the Pacific. RV campers have easy access to the beach, as well as the hiking trails that lead deeper into the park and Crystal Cove is an ideal base from which to explore much of the southern coast of California. Facilities for those camping in a RV at Crystal Cove include Wi-fi, the use of a shower block and toilets, and access to dumpsters for trash. Some RV campsites have hookups, and the maximum length for an RV or trailer is 35 feet. Sites for RVs generally have plenty of space, meaning that the place doesn’t seem overcrowded even when every site is taken. And that can often happen, as Crystal Cove is one of the most popular area campgrounds. One point worth noting is that fire pits and camp fires of any kind are not allowed at Crystal Cove. 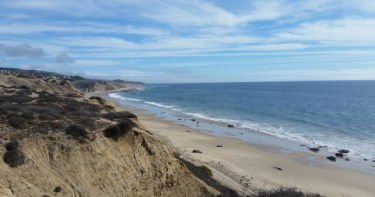 If you are planning a trip to Crystal Cove, call us today to book your RV Rental!